Amos Mayland (Zack) photo by Manuel Harlan. On 23 February 2019 Andrew Lloyd Webber’s award-winning show School of Rock – The Musical will welcome a new kids cast to join Dewey’s band and embrace the power of rock! The hit West End production, based on the iconic film of the same title which this month celebrated 15 years since its UK release, is now booking to January 2020 at the Gillian Lynne Theatre and on 6th March will celebrate 1000 performances. 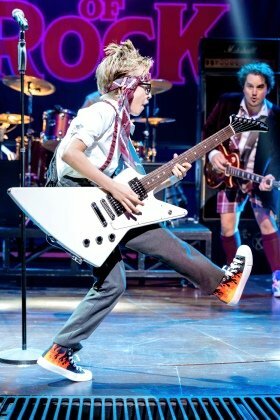 Now in its third year in the West End, the Australian production of School of Rock – The Musical opened at Her Majesty’s Theatre in Melbourne last October and will then play at the Lyric Theatre in Brisbane and the Capitol Theatre in Sydney. The Australian production will also visit Shanghai in February 2019 and a version will also play in Seoul in May 2019. The Broadway production recently concluded its run at the Winter Garden Theatre with a US national touring production continuing. Craig Gallivan leads the cast in the role of Dewey Finn with Laura Tebbutt as Rosalie Mullins, Alan Pearson as Ned Schneebly, Michelle Francis as Patty Di Marco and Jake Sharp who will play Dewey Finn at certain performances. The remaining adult cast comprise John Addison, Nick Butcher, Rob Falconer, Martina Isibor, Claudia Kariuki, Jessica Louise Parkinson, Richard Morse, Andy Rees, Hannah Stratton, Alex Tomkins and James Wolstenholme with swings Paul Kemble, Jessica Kirton, Billy Mitchell, Catherine Morris and Andy Prosser. Based on the hit film, this hilarious new musical follows Dewey Finn, a failed, wannabe rock star who decides to earn a few extra bucks by posing as a substitute teacher at a prestigious prep school. There he turns a class of straight-A students into a guitar-shredding, bass-slapping, mind-blowing rock band. While teaching these pint-sized prodigies what it means to truly rock, Dewey falls for the school’s beautiful, but uptight headmistress, helping her rediscover the wild child within. School of Rock – The Musical features music from the movie, as well as new music written by Andrew Lloyd Webber with lyrics by Glenn Slater and a book by Julian Fellowes. School of Rock – The Musical is directed by Laurence Connor with choreography by JoAnn M. Hunter, set and costume designs by Anna Louizos, lighting design by Natasha Katz, sound design by Mick Potter, music supervision by John Rigby with Matt Smith as musical director. Continuing the search for the opportunity to ‘join the band’, if you are between 8 – 12 years old and play a rock instrument (guitar, bass, piano, and/or drums) or sing, further kids open auditions will take place as follows in Sheffield on Saturday 9 March. In London there will be Band First Round auditions on Monday 25 and Wednesday 27 March 2019 with Ensemble First Round auditions taking place Wednesday 8 and Monday 13 May 2019. All children must be available for contract dates which are July 2019 – March 2020. Registration and further details can be found by contacting Jessica Ronane Casting at rock@jessicaronane.com or at www.schoolofrockthemusical.co.uk/auditions. School of Rock – The Musical is produced in the West End by Andrew Lloyd Webber for The Really Useful Group and Warner Music Group & Access Industries with Madeleine Lloyd Webber as Executive Producer.